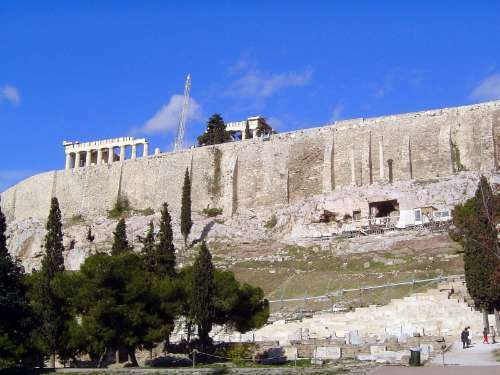 The Acropolis can be studied for its huge influence on architectural history, for its hints at the numerological mysticism of the Greeks, for its hints at the character of Greek religion, for its fame alone. And for more. But we'll start with the facts. 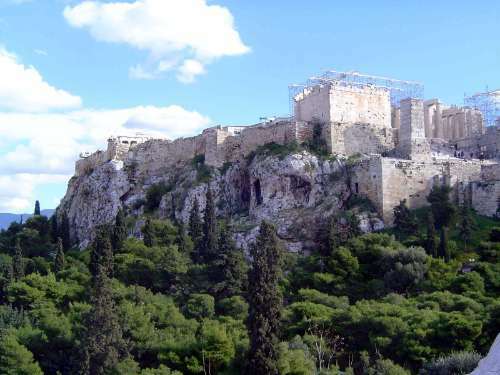 The Acropolis is a once nearly impregnable hill that stands 500 feet about the surrounding plain, is rimmed with 300-foot cliffs, and has a summit measuring 900 by 500 feet. 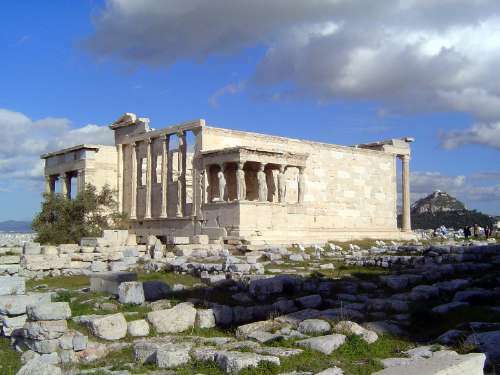 The Erechtheion, at the upper left, peeps over the northern edge, while the great gate of the propylaia is on the right, or west. 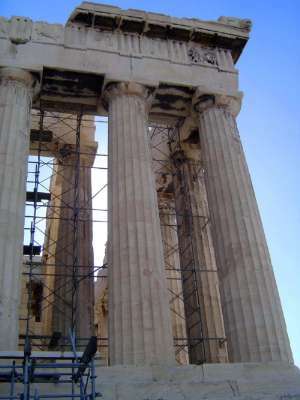 Scaffolding at the far right masks the tiny Temple of Athena Nike. The Turks took it apart in 1686, but it was reassembled after Greek Independence. The process was repeated in the 1930s, and the temple is now undergoing its third and presumably most perfectly authentic restoration. 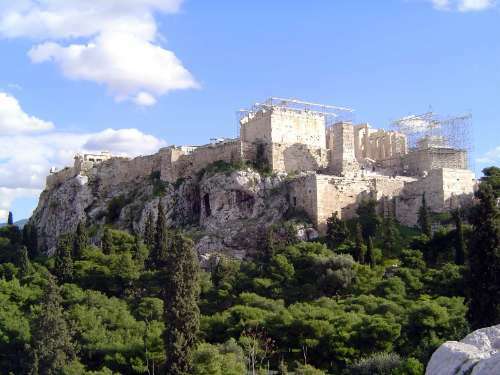 The Parthenon rises above the south wall, with the Theater of Dionysus below. 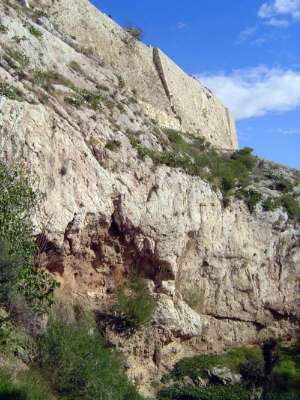 The two columns that appear embedded in the wall--the Wall of Cimon--are actually freestanding votive tripods; just below them and in front of the cave was the choregic monument of Thrasyllos, destroyed in 1827 by Turkish bombardment. Close-up of the votive columns. What you really didn't want to see: the passage through the propylaia early on a low-season morning, before the real crowd arrived. The gate once marked the passage from low secular to high sacred space: heaven only knows what it represents today. A view from below, looking through the Beulé Gate, named for Ernst Beulé who in 1852 unearthed it from Turkish bastions. 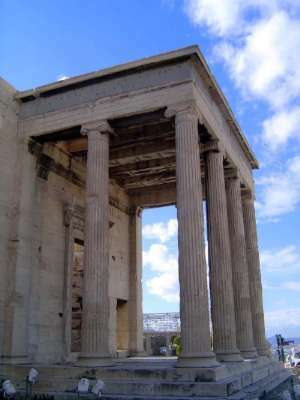 The north porch of the propylaia, in stark Doric. The columns have the standard 20 flutes. The south wing, with one of the main-gate columns on the left. 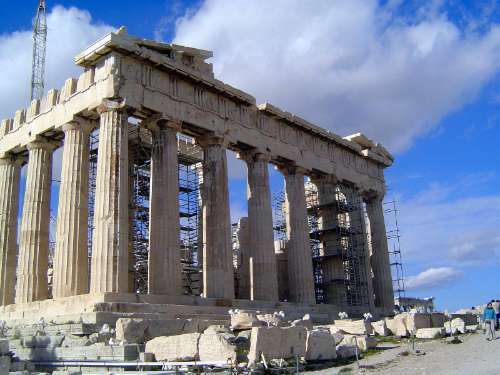 It's been under restoration since 1909, a much longer time than Mnisicles spent building the structure during the 430s. 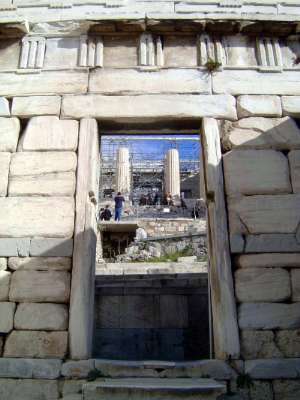 The left porch and two of the columns of the gateway proper. 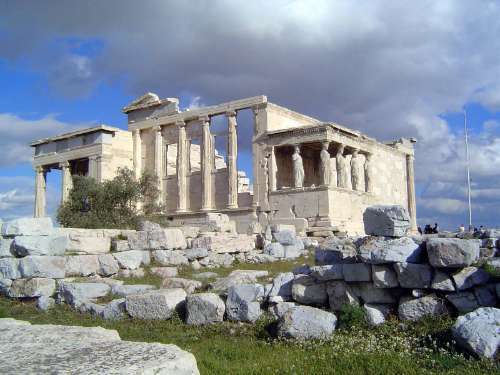 On top, with the Parthenon on the right and the Erechtheion on the left. 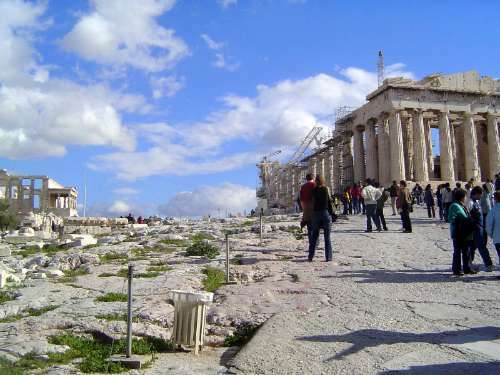 The space between was once crowded with monuments, including a giant statue of Athena. 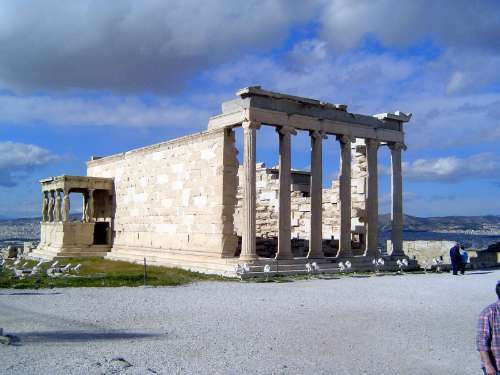 There were other images of her inside the temples, including a huge and hugely famous one inside the Parthenon and a crude but sacred one--hardly more than a dressed plank of olive wood--inside the Erechtheion. The rocky surface is the result of assiduous digging by mostly German archaeologists in the 19th century. They were working in a trans-European, philhellenic tradition marked, to take one important early case, by the publication in 1789 of Antiquities of Athens by James Stuart and Nicholas Revett. The book launched Greek Revival architecture in England. The classical education that came along with it is long gone. Proof? Mary Beard (in The Parthenon, 2002)recounts a conversation between a newspaper reporter and Shaquille O'Neal. 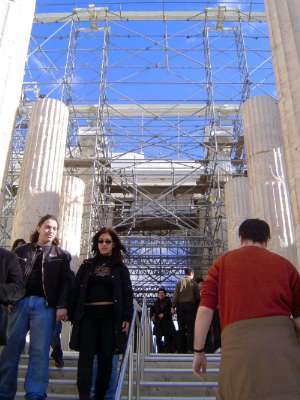 Q: "Did you visit the Parthenon during your trip to Greece?" A: "I can't really remember the names of the clubs we went to." 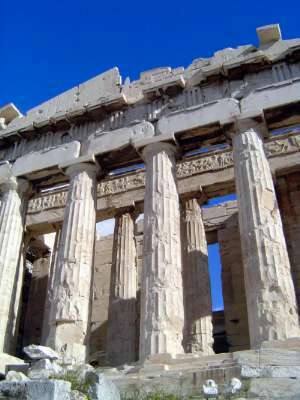 The Parthenon's west facade. The inner rank of 6 columns wraps a porch beyond which there was a windowless room, a treasury filled not with cash but with Persian daggers, thrones, couches, and shields. 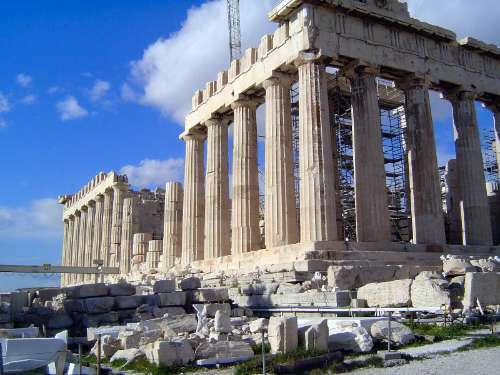 When the Parthenon became a church in the sixth century, this west side became the main entrance, and doors were opened in the wall separating the treasury from the image house to its east, which housed the famous statue of Athena but which now became a nave with an altar to the east. The cult room had measured 100 by 63 feet, and it had held Phidias's 32-foot image--wooden core, with ivory skin--of Athena Parthenos. 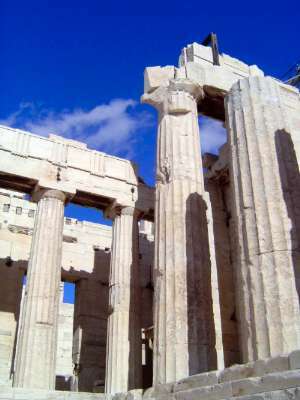 (A full-size replica, as accurate as can be made today, has stood since 1990 in Tennessee's own Parthenon, built originally for the Tennessee Centennial Exposition of 1897.) Metal grates--functionally gates--originally blocked the spaces between the interior rows of columns on both the east and west sides. How often they were open is unknown, as is, oddly enough, even the original function of the building. In the shade atop the architrave you can make out the vertically striped triglyphs and the interspatial metopes, which were sculpted, though this was unusual for such buildings. 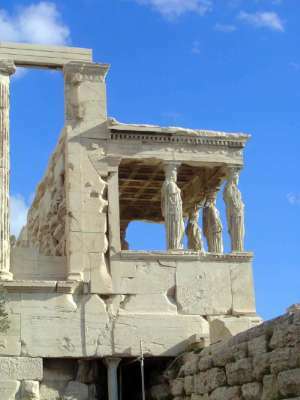 Atop the second rank of columns is the famous frieze, 524 feet as it wraps the whole building with pictures of an unknown narrative subject, perhaps the panathenaic procession. 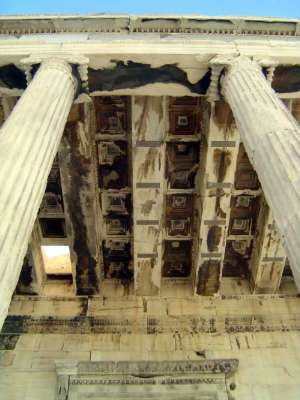 The frieze was originally lost in shadow under a solid roof, but much of it is now far more visible because it is in the British Museum, where it lines the walls of the Duveen Gallery. Good thing? Opinions differ. South side. The whole structure is designed on a module of .858 meters, equal to the radius at the base of the exterior columns. The columns are centered 5 modules apart and are 12 modules high. 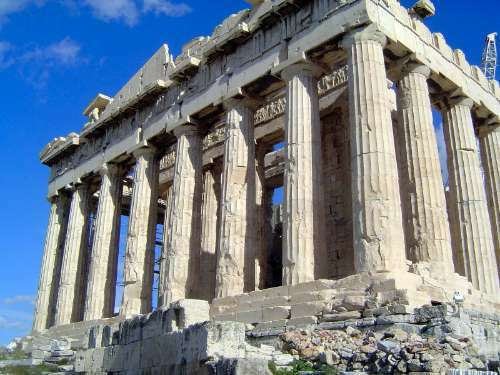 The module determines the breadth of the triglyphs and the height of the capitals. Assemble a square of 81 such modules, then replicate that square to form a rectangle of 4 squares by 9. That's the formula determining the floor of the whole building, which measures 110 feet by 237 at its base or 101 by 228 at the stylobate, the top of the platform. That stylobate is not flat, however, and has a slight arc of a few inches--helpful with drainage, if nothing else. The frieze and the building's other horizontals are arched to match. 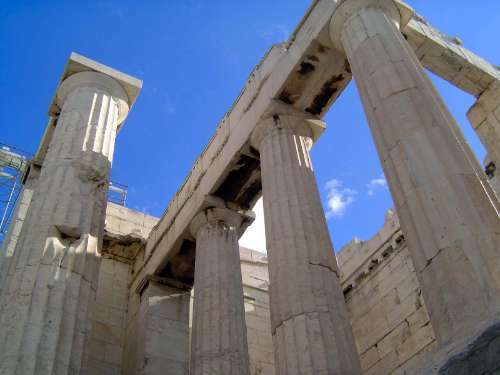 The 4:9 ratio also describes the relationship between the diameter of the columns and the space between them, and it is the ratio between the height of the entablature and the temple's width. Scary, isn't it? East end. The interior was altered with the conversion to the Byzantine church of Our Lady of Athens in the sixth century, when the apse behind the altar extended nearly to the outer columns. 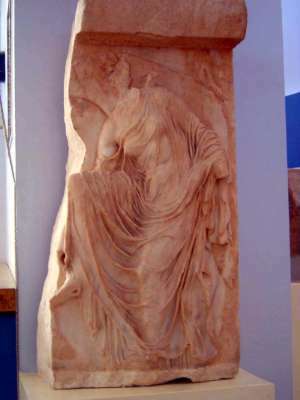 Among the losses at that time were the pediment sculptures, which Pausanias, who was here in the second century, says showed the birth of Venus--a topic hardly likely to please pious Christians. (Conversion of temples to churches could, on the other hand, help preserve them. 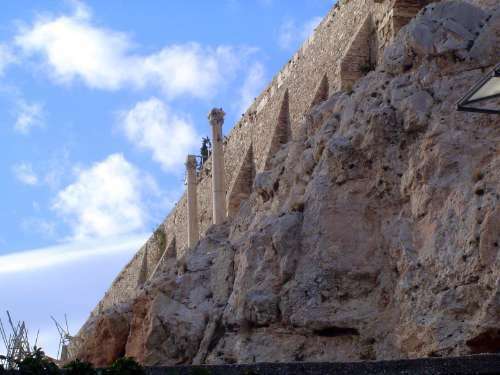 A good example is the cathedral at Syracuse, whose walls still consist largely of the colonnades of a temple of Athena.) The Parthenon became a mosque in 1456, but it survived that, too, as shown by the 15th century sketches of Cyriac of Ancona, who drew the pediment sculptures largely intact. During a bombardment in 1687, however, the building was done in by a German officer hired by Venice. Under his direction, 700 cannonballs hit the building. One set off the gunpowder the Turks had stored inside. Barbarians? Not quite so much as you might think: an eyewitness wrote of the Swedish count in command of the attacking army: "How it dismayed His Excellency to destroy the beautiful temple that has existed three thousand years and is called the Temple of Minerva. In vain, however: the bombs did their work so effectively that never in this world can the temple be replaced." (Quoted by Beard, p. 80.) 300 people died in the explosion, which blew away the columns along the sides of the building, leaving the two ends seeming to be two separate buildings. 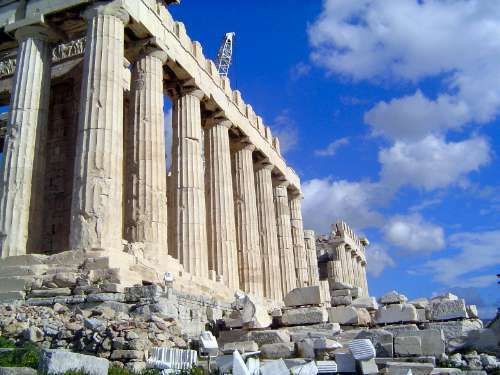 (So it appears in the earliest photograph of the Parthenon, taken in 1839.) The Turks capitulated, but a year later they were back. In the wreckage of the demolished central hall they build a small mosque whose dome barely peeped over the surviving columns. The building's central temple-like structure, 38 by 75 feet, is conventional at first glimpse but actually very unusual, because the two ends are at different heights--with a difference of about 10 feet. 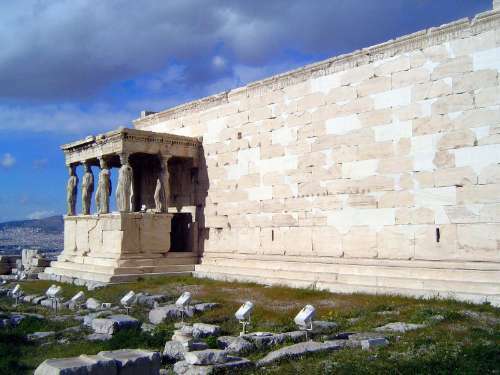 In addition, a large porch has been added to the north side (on the left here) and a smaller one, the famous porch of the maidens, on the south. 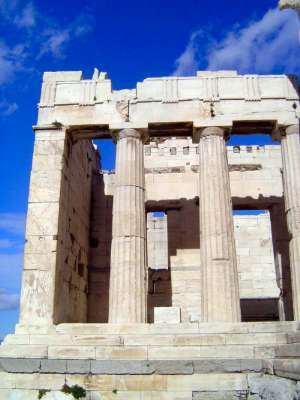 The interior was subdivided into several rooms housing shrines for several gods, including not only Athena but Poseidon. It was later used as a Christian church and Turkish harem. Coffered ceilings of north porch. 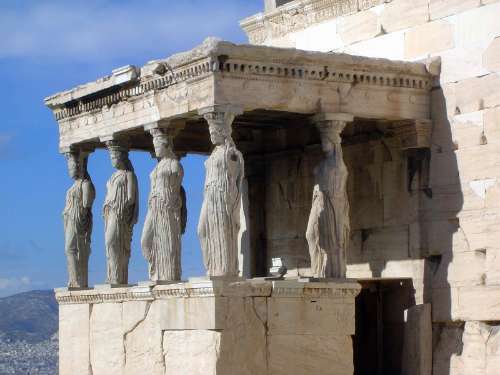 The Porch of the Maidens, popularly called caryatids. 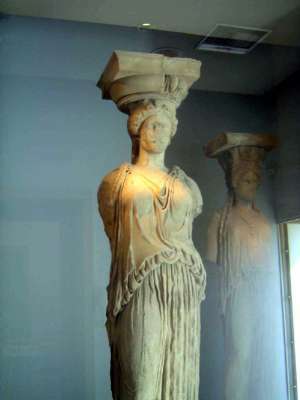 These are copies of the originals, which are mostly held in the Acropolis museum. One of the originals, behind glass. If you believe Vitruvius, you'll understand why she isn't smiling. Also in the museum, an image of Nike adjusting a sandle and in her lightness living up to her epithet, "winged."